We had a fun time for our first sew day of the year. 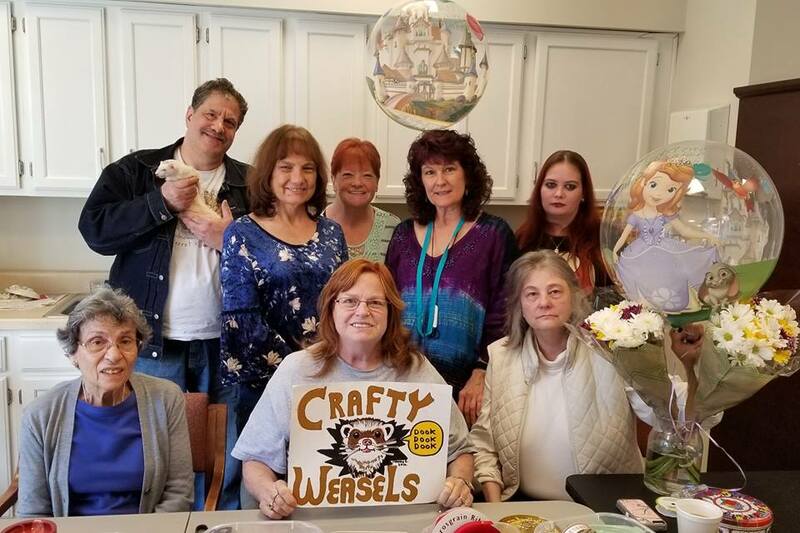 Lisa organized a wonderful BBQ, and make delicious sides so that we could stay in our crafting room and keep going on our ferret bedding. Here is our first Crafty Weasel Sew Day of 2019 Picture. The wonderful Christmas decorations were still up at Brookdale. Karen is holding Fi, Morgan’s boy. Johnny didn’t get into the first picture, but he was lucky and had a separate picture with Finch, Morgan Tangren’s other boy. So, we had a really good start to our year, and we also have a nice amount in process that we will be able to work on next month. This entry was posted in Sew Day on January 9, 2019 by Nikki Rockstroh. The Crafty Weasels finished off the year with a fun sew day, and sharing of all types of food in the Brookdale Crafting Room. 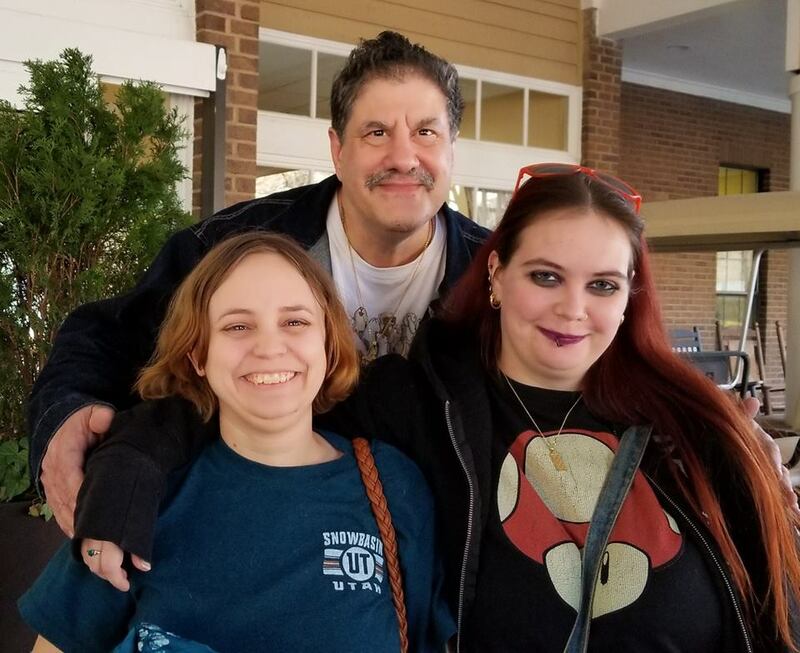 Johnny brought his two sweet girls to share with us and the residents. This entry was posted in Sew Day on December 9, 2018 by Nikki Rockstroh. Saturday at the crafty weasels sewing day, we were short of some of our regulars. The good news is that we had gotten lots of the bedding almost to the second to last step. This full bag is what we were able to complete!! Morgan, is holding Sue Pyron’s little girl. The residents at the nursing home always love to have the ferrets there to visit. This seemed like the perfect time to do a fun sew day, so next month we will be having a fun sew day. If you have a craft you want to learn, or a fun idea, just let us know. This entry was posted in Sew Day on November 9, 2018 by Nikki Rockstroh. Yes, I’m very very late with this message. But we did have a wonderful group for last month sew day. We had Diane Lund visiting us from North Carolina, and she blended right in and helped us keep things rolling. Now, it doesn’t look like our total is as big as usual, but the good news is there is a lot of stuff that is just right there at the end waiting for the last two final steps ….so we should be able to make up the count next month. Hoping we have a huge turnout to get it all accomplished. This entry was posted in Sew Day on October 9, 2018 by Nikki Rockstroh. Well, we were a small group, but very accomplished on this month. Lisa brought some wonderful cupcakes, also meat, cheese and crackers to help celebrate Elsa’s Wedding. I’ve attached a picture to this message, and it was taken in the dining room where we have lunch. Our resident Crafty Weasel, Georgina, had to go have lunch with her husband so wasn’t in the picture this time. She is actively recruiting other residents, and hoping that we will have a couple more residents to help us next month. This entry was posted in Sew Day on September 9, 2018 by Nikki Rockstroh. Well, we got off to a slow start (me taking care of bees before sewing day), but we really did have a good turnout, and got a lot accomplished for the day. We do have a lot of things pinned, so hopefully we will have some extra people there next month to do some of the front end sewing. Always a good time being with the Crafty Weasels. This entry was posted in Sew Day on August 9, 2018 by Nikki Rockstroh. We were a small group this month, but we still accomplished a lot, and had fun doing it. Johnny brought his two little girls to play with us, and Gracelyn spent lots of time holding them! We are changing our sew days to be the first Saturday of each month from the our next date of August 4. Hope to see you all there!! This entry was posted in Sew Day on July 5, 2018 by Nikki Rockstroh. Well, it was quite a day for all of us on Saturday. Morgan brought her furkids, which went over well with the residents! Sue was our Birthday Girl, so Lisa made a cake, and there were balloons, and ice cream from the kitchen. I think a good time was had by all!! We did accomplish a abit, and the good news is that we also have lots of things that are in process too for next month. We are trying to get a date change for our monthly sew days. It looks like we would have an easier time the first Saturday of the month. Things are set in stone yet, but Lisa will let us all know as it happens. Thanks for being such an amazing group!! This entry was posted in Sew Day on June 5, 2018 by Nikki Rockstroh. We had a wonderful sew day (you are more than welcome to join us, if you haven’t before) this past Saturday. We were lucky that we already had some bedding started along the process, and just needed some of the final ribbons and finishing. We really concentrated and got a lot of stuff in progress, so I’m hoping we will do just as well next month. Our meeting will be on June 9th. Hope to see you all there!! So very proud of every person in this group!!! This entry was posted in Sew Day on May 5, 2018 by Nikki Rockstroh. What a Wonderful Welcome Home from the Crafty Weasels yesterday!!! Lisa made some Banana-Banana Bread cake, and Sue had some beautiful flowers, and fun balloons for both Karen and me. Soooooo blessed to have such a wonderful caring group!! Morgan had to work most of the day, but cared enough to stop by and help afterwards. She wasn’t early enough to be in the group pic, but got her outside with Johnny and Elsa! Our next sew day will be April 14th. Hope to see you all there!! This entry was posted in Sew Day on March 19, 2018 by Nikki Rockstroh.